The number of hours spent together by family members is a cause for concern. Children are often cooped–up indoors while their parents are busy trying to make ends meet. This is indeed a worrying trend as family members are now living as roommates who know very little about each other. That said, family activities have been proven to cultivate togetherness along with other benefits. Nowadays, it is hard to find someone enjoying their free time without being attached to their gadgets. Surprisingly, most people only come for air during meal times. Spending time together as a family engaged in a joint family activity without being glued to our devices helps in shunning unhealthy lifestyle behavior. As much as you are bound to get some opposition from some family members – especially those tech-savvy ones, doing this will undoubtedly help you improve the quality of your life. Spending time together relaxing or doing something together can help you draw closer to those that matter most. Just like couples benefits from spending time together, the family as a unit benefits significantly from engaging in common fun activities. In fact, families that spend their leisure time together have been proven to bond better and tend to be more satisfied. Kids need to be actively engaged with family members to develop well. 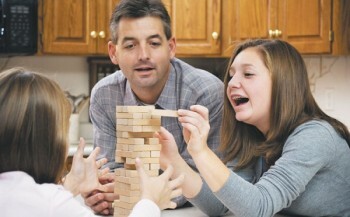 Spending time together in family activities goes a long way towards helping them intuitively learn from their parents. Parents too have an opportunity to impart life-long lessons, which are vital in making kids responsible citizens in future. Parents too have a chance to learn from kids, which goes a long way in establishing cordial family relationships. Family members can spend their time in different ways. This could be a family game night, playing your favourite sport, or go to a cultural event – the most important thing is to find a fun activity everyone enjoys.